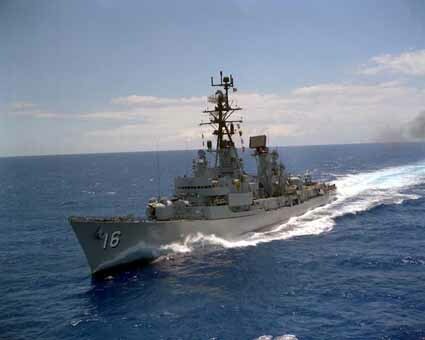 The USS JOSEPH STRAUSS (DDG-16), a Charles F. Adams-class guided missle destroyer, was commissioned on 20 APR 1963. USS JOSEPH STRAUSS served her country for 26 years, 9 months and 12 days, until decommissioned on 1 FEB 1990. Joseph Strauss (DDG-16) was laid down 27 December 1960 by the New York Shipbuilding Corp., Camden, N.J.; launched 9 December 1961; sponsored by Mrs. Lawrence Haines Coburn, granddaughter of Admiral Joseph Strauss; and commissioned in the Philadelphia Naval Shipyard 20 April 1963, Cdr. William M. A. Greene in command. Joseph Strauss departed Philadelphia 6 June 1963 for a brief cruise to Puerto Rico and Willemstad, Cracao, and then transited the Panama Canal to join the Pacific Fleet on the western seaboard. She arrived in the Long Beach Naval Shipyard 13 July 1963 for alterations, followed by tactics out of San Diego north to Seattle, Wash. The flagship of Destroyer Squadron 3, Joseph Strauss sailed from Long Beach 30 June 1964. After calling at Pearl Harbor and Midway Atoll, she arrived in Yokosuka, Japan, 18 July. She departed 3 August 1964 to rendezvous off Okinawa 6 August with Constellation (CVA-65). She then patrolled off the Vietnam coast and the South China Sea with task forces built around Constellation, Kearsarge (CVS-33) and Ticonderoga (CVA-14). Brief sweeps were made to the Philippines and ports of Japan. She arrived in Yokosuka 15 December 1964 for upkeep, again sailing 21 January 1965 to support U.S. Forces in Vietnam until 1 March. During this period, she operated with Ranger (CVA-61), Hancock (CVA-19), Coral Sea (CVA-3), and Yorktowm (CVS-10). Following upkeep in Subic Bay (1-10 March), Joseph Strauss sailed with ships of the Royal Thai Navy for exercises in the Gulf of Thailand. She was briefly flagship of the 7th Fleet (22-26 March) during the official visit of Vice Admiral Paul B. Blackburn, Jr., to Bangkok, Thailand. She departed Yokosuka, 19 April for operations that brought recognition and honor to both the ship and her crew. Commencing 24 April 1965, Joseph Strauss, together with Ernest G. Small (DDR-838), was part of the first advanced SAR/AAW picket team in the Gulf of Tonkin to support U.S. air strike operations against North Vietnam. From 16 through 21 May, she observed operations of a Russian task unit. She returned to Yokosuka (23 May-4 June), then again sailed for the Gulf of Tonkin. Her ensuing 27 days as flagship of the AAW/SAR picket unit were highly successful, establishing operational procedures and capabilities which remain destroyer standards. On 17 June 1965, two F4B Phantom's from Midway (CVA-41), under Joseph Strauss' advisory control, shot down two MIG-17's, accounting for the first two hostile aircraft downed by U.S. Forces in aerial combat since 1953. Three days later, two propeller-driven Skyraiders, also from Midway and under Joseph Strauss' Combat Information Center team were decorated by the Secretary of the Navy. Joseph Strauss arrived in Hong Kong 6 July 1965, putting out to sea 14 to 16 July to avoid Typhoon Freda, and again 18 to 19 July to carry the 7th Fleet Salvage Officer to Pratus Reef to assist in refloating Frank Knox (DDR-742). She departed Hong Kong 21 July for Yokosuka. The following day she took a disabled Nationalist Chinese fishing boat in tow and delivered it safely to Keelung the 23d, thence sailed to Yokosuka, arriving 25 July for upkeep. On 3 September 1965, she successfully fired two improved Tartar missiles off Okinawa. After a 1-day stop at Sasebo, Joseph Strauss proceeded south in the screen of Bon Homme Richard (CVA-31). Upon arrival in the South China Sea, she was detached for picket patrol in the Gulf of Tonkin during the last 3 weeks of September She spent the first 2 weeks of October supporting operations off Vietnam in the screen of Bon Homme Richard and Oriskany (CVA-34). She then returned to Subic Bay for naval gunfire support training which continued off Da-nang, South Vietnam. On 28 October 1965, she fired her first shots in anger, expending 217 5-inch shells in support of a combined ARVN-Marine Corps search-and-destroy operation against the Viet Cong. 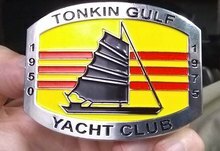 Throughout November she formed an advanced SAR/AAW picket team with Tucker (DD-875) in the Gulf of Tonkin. She returned to Yokosuka 7 December 1965 for upkeep and preparations to resume operations off South Vietnam. Joseph Strauss returned to the Gulf of Tonkin 10 February 1966 and remained active in the war zone until heading for Hong Kong exactly one month later. Back in the fighting 26 April, she remained in the war zone until returning to Yokosuka 15 June. That day her home port was changed to Pearl Harbor which she reached 26 July. Joseph Strauss operated in the Hawaiian area until heading back for the Western Pacific 14 January 1967. She remained in the Far East supporting the struggle against Communist aggression until returning to Pearl Harbor 17 June. There she prepared for future action.